This evening, the Hurricane Hunters found not only a closed center but also winds greater than 40 mph. 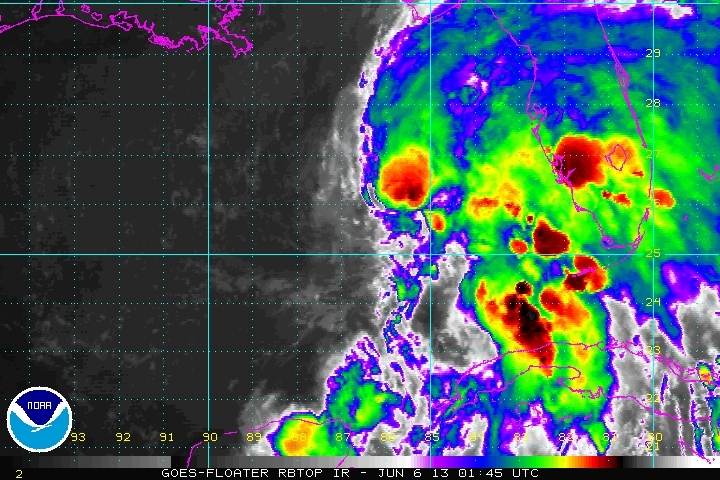 Soon after, the National Hurricane Center upgraded 91L to Tropical Storm Andrea. As of 11pm, Andrea has winds of 40 mph with higher gusts about 270 miles west-southwest of Tampa, FL. Andrea remains a lopsided storm with most of its energy off to the eastern side of the storm, however thunderstorms have built up around Andrea’s center. I want to stress this is not a big storm, but it is one that you will have to be careful about as you go about your daily activities tomorrow. Don’t stress out about this system. Rain – the main impact remains to be the heavy rainfall that will fall from Perry to Lake Okeechobee. A large area of the Big Bend area down into central Florida will see 3-6″ of rain as feeder bands set up and the rain shield expands northward. Some areas could see 6-8″ of rain in localized area. A FLOOD WATCH remains in effect through tomorrow night for most of the northern two-thirds of the Florida peninsula. This means flooding is a possibility across that area, and if you see flooded roadways, just turn around! Wind – Winds will become gusty across the west coast of Florida and inland to I-75 tomorrow morning, with gusts to 40 mph in those areas. A TROPICAL STORM WARNING is in effect for the western coast of Florida from Charlotte County in SW Florida to St. George Island in Franklin County, FL. Areas in this warning can expect sustained winds to 40 mph, with the highest probability of tropical storm force winds occurring in the Big Bend. Winds of tropical storm strength will begin to reach the coast tomorrow afternoon. As Andrea passes over the southeast, winds are expected to increase on the Atlantic coasts of Florida, Georgia, and the Carolinas. For that reason, a Tropical Storm Watch has been issued from Flagler Beach, FL to Surf City, NC. 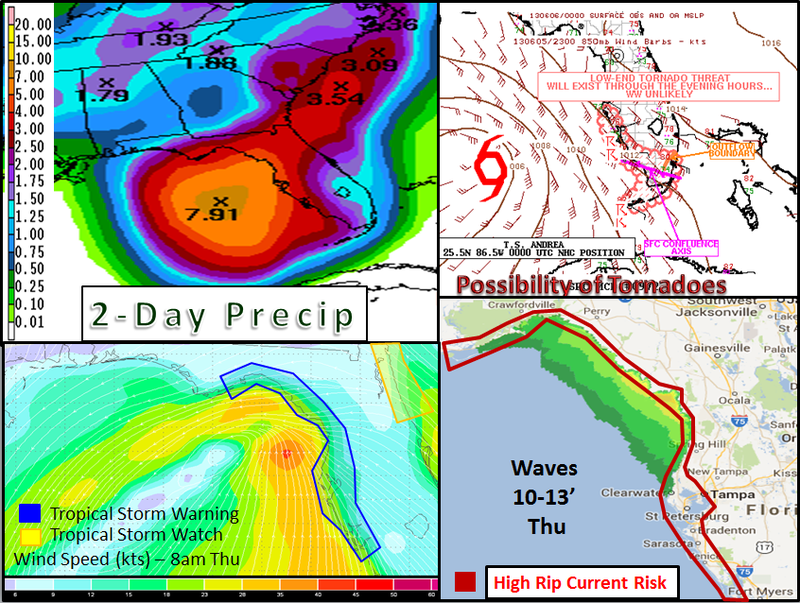 Tornadoes – There has already been tornadic activity just off shore Southwest Florida. This activity will escalate through tomorrow morning and spread northward. I expect a tornado watch will be issued for the west coast of Florida overnight into tomorrow morning. An enhanced risk of tornadoes exists for all day tomorrow for this area. Tornadoes will occur in bands as they rotate from south to northwest cyclonically. These will NOT be anything like those in Oklahoma. Keep your weather radios on tonight. Tornadoes that do form will short-lived and weak. Surge – This is a minor impact threat, but for those that live right along the coast, you will see a 2-4 foot rise at high tide during surge. Sandbags are becoming available in different area. If your area is prone to surge or flooding, prepare! Waves – Do NOT go out on the water tomorrow. Waves could be as high as 14 feet away from the coast, and will overtop boats that try to venture out. 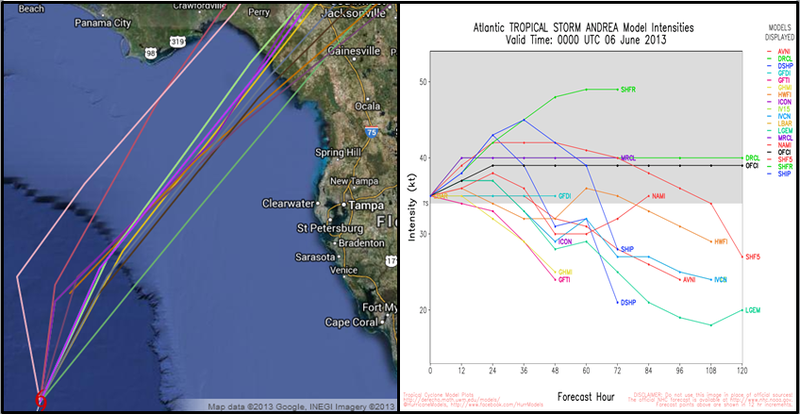 The exact center will likely hop around from time to time as Andrea continues the organization process. Each “hop” may cause a small change in forecast path in the long-term, but these are unpredictable, and with this storm will not change the overall impact to a particular region. Andrea is riding northward along a “weakness”, which in short is an elongated area of lower pressure in between high pressure. Starting tomorrow, Andrea will begin to feel an upper level trough which will cause Andrea to accelerate toward the north. How much acceleration will occur is up to some debate depending on which model you look at. Some differences in rainfall totals will occur depending on the forward speed of Andrea. I believe Andrea will continue to intensify as it organizes, and winds could increase to as high as 45-50 knots (or 50-60 mph) tomorrow afternoon. After that land friction and cooler shelf waters will stall intensification growth. Severe wind gusts may occur across the Big Bend region into southeast Georgia. As always, follow me on twitter overnight and into tomorrow for the latest updates at @JonathanBelles. Recon is on it’s way to Andrea at this time. Posted on Wednesday, June 5th, 2013, in Florida Weather, Tropical Weather. Bookmark the permalink. Leave a comment.